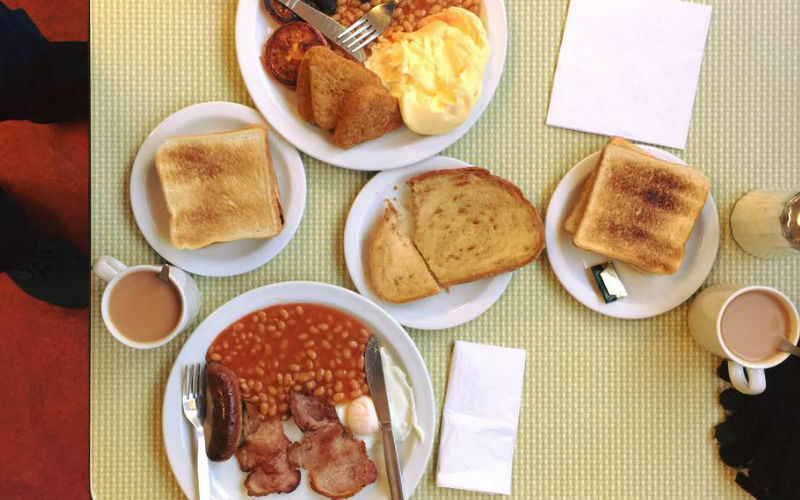 We all love a good fry-up – so where are the best full English breakfasts in London? After all, breakfast is the most important meal of the day. Regency Cafe has been going since 1946 (the original tiling is still intact), is probably one of the most famous greasy spoons in town thanks to it appearance in several films and TV shows. It’s excellent value too with the standard brekkie coming in at just over a fiver. Easily one of the best full English breakfasts in London. Located in Borough Market, Maria’s Market Cafe is almost as iconic as the market itself. Maria began working there aged seven and has been running the joint ever since. This is the place for a big brekkie – don’t skip the bubble & squeak – a mug of strong tea and a lively atmosphere. 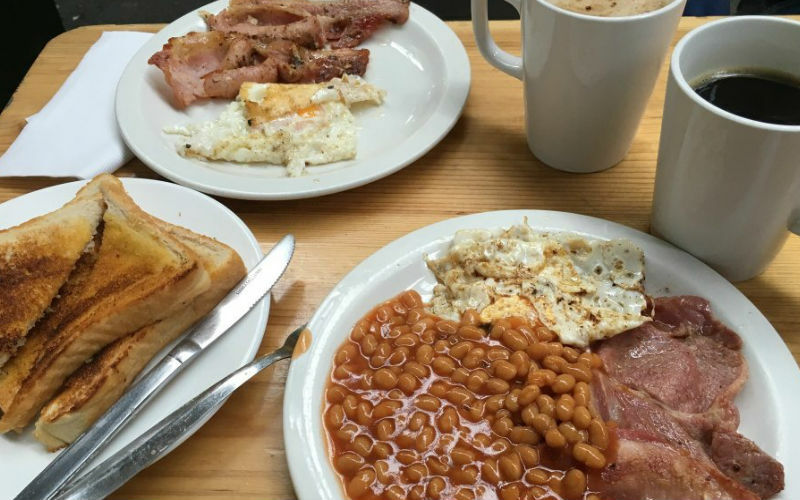 Using ingredients sourced from nearby Smithfield and Borough Markets, Terry’s Cafe serves traditional home cooked meals, including a famous fry-up. Choose between ‘the standard’, ‘the works’ or ‘the blowout’. The Hoxton Grill restaurant inside The Hoxton, Shoreditch hotel hits the spot with their half, full, or veggie fry-ups. Available as early as 7am, this is one for early risers. There’s plenty of strong cofee and tea available too. 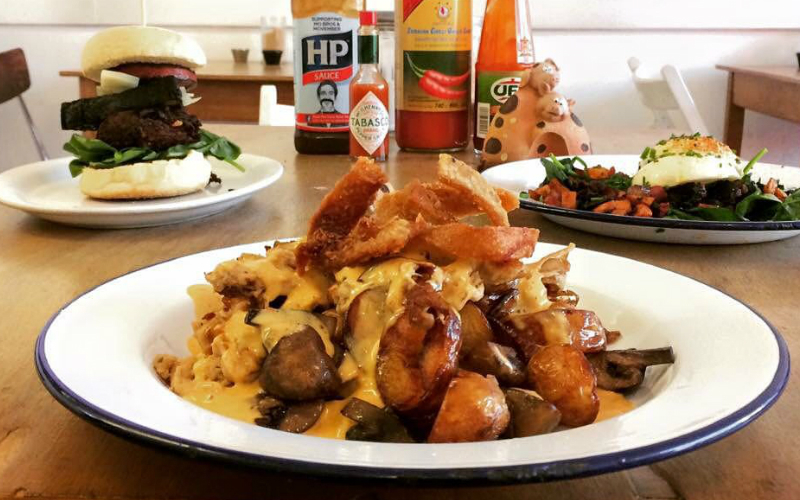 The Ginger Pig Cafe in Hoxton is the place to go if you want a hearty and high quality fry-up. The menu is short and sweet (saves you wasting time trying to choose what to order), all ingredients are sourced locally and it won’t cost an arm and a leg. 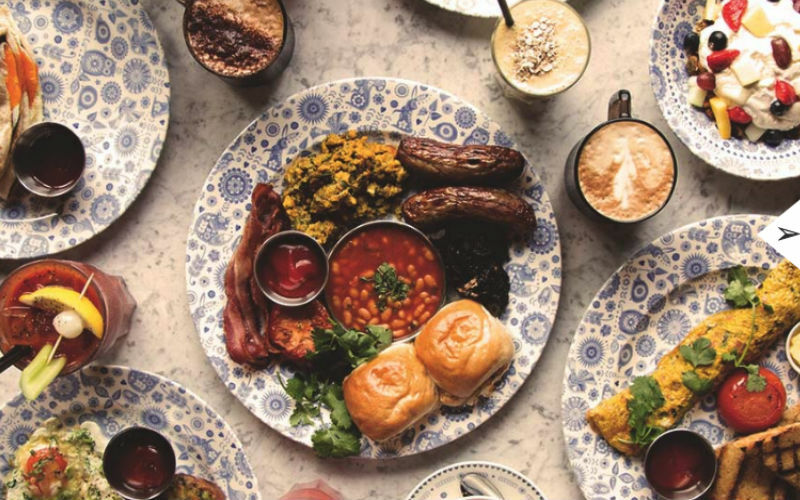 We always gravitate towards the bacon and egg naan but Dishoom also does a pretty bangin’ fry-up, with a Bombay twist of course. You get spiced scrambled eggs, masala baked beans and buttered buns alongside your bacon, sausages, mushrooms and tomato. This popular art deco cafe, which has been going since 1946 (the original tiling is still intact), is probably one of the most famous greasy spoons in town thanks to it appearance in several films and TV shows. It’s excellent value too with the standard brekkie coming in at just over a fiver. Located in Borough Market, Maria’s Market Cafe is almost as iconic as the market itself. Maria began working there aged seven and has been running the joint ever since. This is the place for a big brekkie – don’t skip the bubble & squeak – a mug of strong tea and a lively atmosphere. 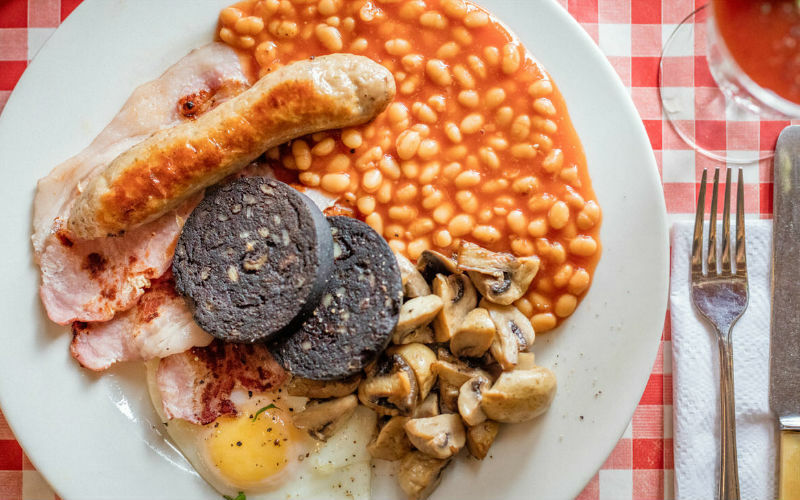 Using ingredients sourced from nearby Smithfield and Borough Markets, Terry’s Cafe serves traditional home cooked meals, including a famous fry-up. Choose between ‘the standard’, ‘the works’ or ‘the blowout’. The Hoxton Grill restaurant inside The Hoxton, Shoreditch hotel hits the spot with their half, full, or veggie fry-ups. Available as early as 7am, this is one for early risers. We always gravitate towards the bacon and egg naan but Dishoom also does a pretty bangin’ fry-up, with a Bombay twist of course. You get spiced scrambled eggs, masala baked beans and buttered buns alongside your bacon, sausages, mushrooms and tomato. 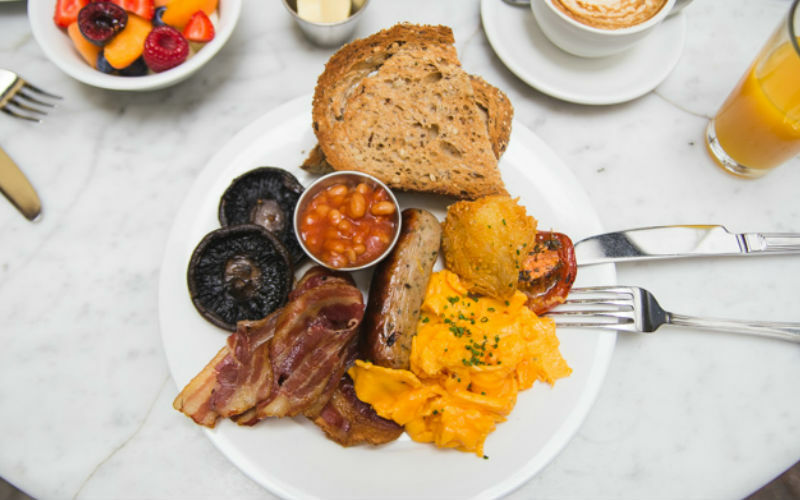 The Ginger Pig Cafe in Hoxton is the place to go if you want a hearty and high quality fry-up. The menu is short and sweet (saves you wasting time trying to choose what to order), all ingredients are sourced locally and it won’t cost an arm and a leg. 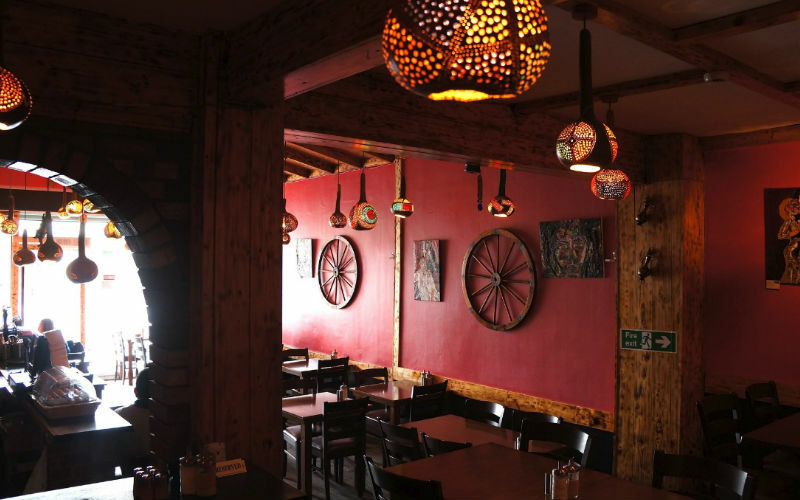 Red art cafe is famous for their large selection of fry-ups and Turkish breakfasts. 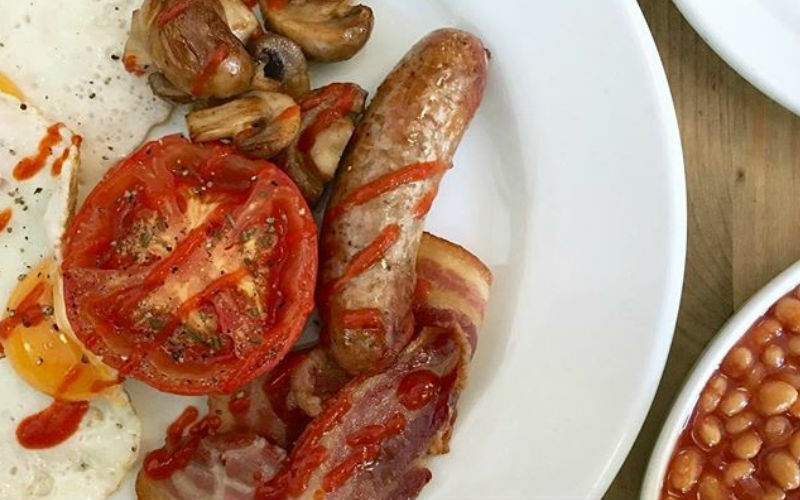 Vegan, vegetarian, or meat-eaters, you’ll be sure to get your fry-up fix here. Get there early though as this cafe is known to fill up fast! The couple behind this modern British diner are committed to using only the freshest organic and free-range ingredients but don’t worry, they still know how to whip up a hangover-busting brekkie. If you can’t fit in a full English, they do a half English although we often get tempted by that pork belly benedict.